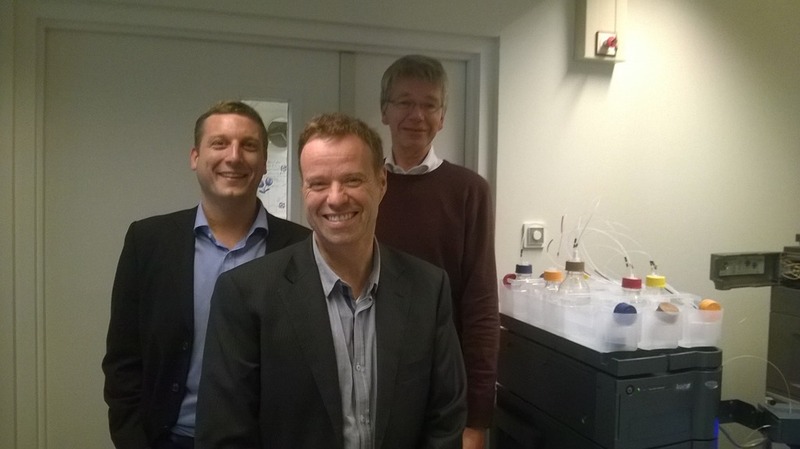 Last Friday, I visited a team of proteomics users who adopted Progenesis as early as 2009. I feel connected with this group because I made the first phone call to Prof Theo Luider, Head of Laboratory, Neuro-Oncology, Erasmus Medical Centre in the Netherlands back in 2008. I remember it vividly, as I was calling to see if he’d be interested in trying out the new Progenesis technology, having got his name via a chain of referrals. Theo managed to reply to my introduction with 2 words (polite ones!) that made me burst out laughing and from there a great collaboration was born :). Theo’s group evaluated the software and bought a license early in 2009; they have gone on to be our most prolific publishers with over 16 papers citing the use of Progenesis QI for proteomics. This visit was a good one; I was accompanied by 2 of my Waters colleagues, Dr Perry Derwig (Product Specialist) and Dr Ian Edwards (Omics Business Development Manager), both very knowledgeable about instrumentation. We spoke with Theo and his colleagues, Christoph Stingl and Dr Lennard Dekker, and over coffee and cakes we learned about the work that the team at Erasmus is doing and where they perceive the current limitations of the technology to be. As a company, we are keen to form collaborations with our users and, over the years, the team at Erasmus have helped us with their suggestions and feedback. Our development team here at Nonlinear Dynamics insists upon fully understanding the problem so that they can find the best solution, which is why good collaborations are so important to us; it takes time and effort to fully explain a detailed problem in the research workflow. During a very nice lunch at The Harbour Club, I explained how Nonlinear Dynamics is run and roughly what our schedule for releases is. We ended with a tour of the labs on various floors of the building, including a stunning view over Rotterdam from floor 23. The group has 10 instruments from various vendors and, of course, they can analyse their data from all these different instruments using Progenesis QI for proteomics, as it is multi-vendor. This is one of the strengths most cited by our users when asked what they like about Progenesis. If you’d like to read more about the work being done by Theo and his team, take a look here. This entry was written by Juliet Evans, posted on October 27, 2014 at 11:35 am, filed under October 2014 and tagged Progenesis QI for proteomics. Bookmark the permalink. Follow any comments here with the RSS feed for this post. Post a comment or leave a trackback: Trackback URL.